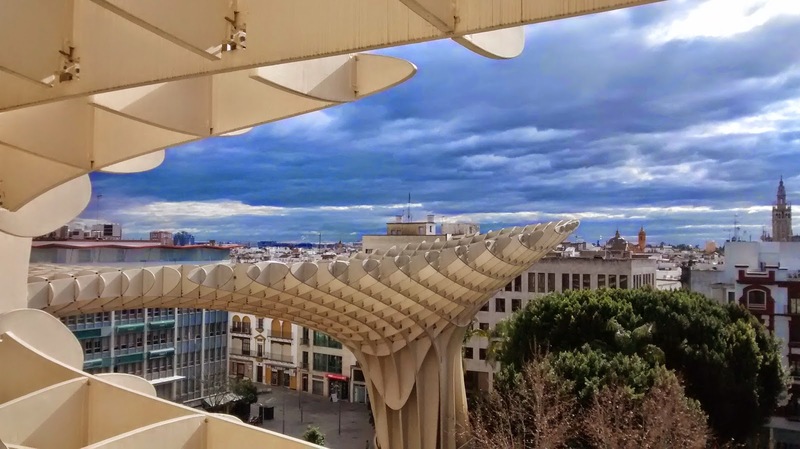 What is it like to live in Sevilla? It’s those laughably beautiful landmarks and picturesque winding streets. The colourful sunsets, the buildings that seem to almost glitter under blue Spanish skies. I love the drama of flamenco, the vivacity of Sevillian locals who will work all day and spend all night sharing beers and tapas with friends. I love tapas. Deep fried aubergines with sticky honey sauce, grilled goats cheese sprinkled with almonds, freshly fried fish, grated tomatoes, and all manner of croquettes. I love this city that has been drenched in history. Where authentic Moorish tiles creep up the sides of Catholic churches. Where Hercules lived. This city that has seen prosperity, violence and cruelty. Where Columbus set sail for “India”. Where Jews and Moors were forcibly expelled by the catholic “reconquistadores” – communities who were kicked out from the homes and left beautiful and lasting marks behind them. I love the Alcazar. And I love the palm trees! Tropical birds tweeting above you and stray cats lurking behind railings. I love showing visitors around the city and when they say “I think this is the most beautiful place I’ve ever been”, I think, yeah, you’re probably right. I love the bustle of the Macarena where children play out in the street til midnight. The conservative traditions and alternative cafés. I love the people I’ve met. I even love the virgens of Semana Santa! Here are more posts from Seville.